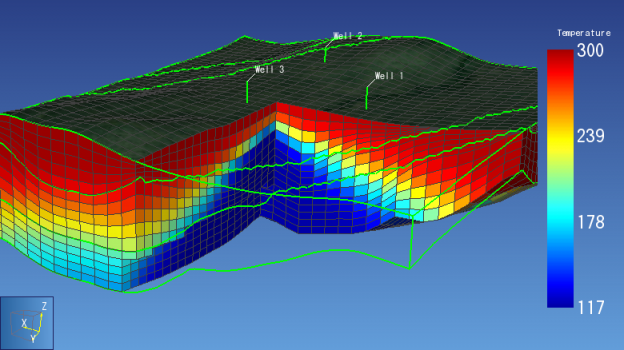 PetraSim includes tools to represent geological formations and faults in a conceptual model independent of the model mesh. 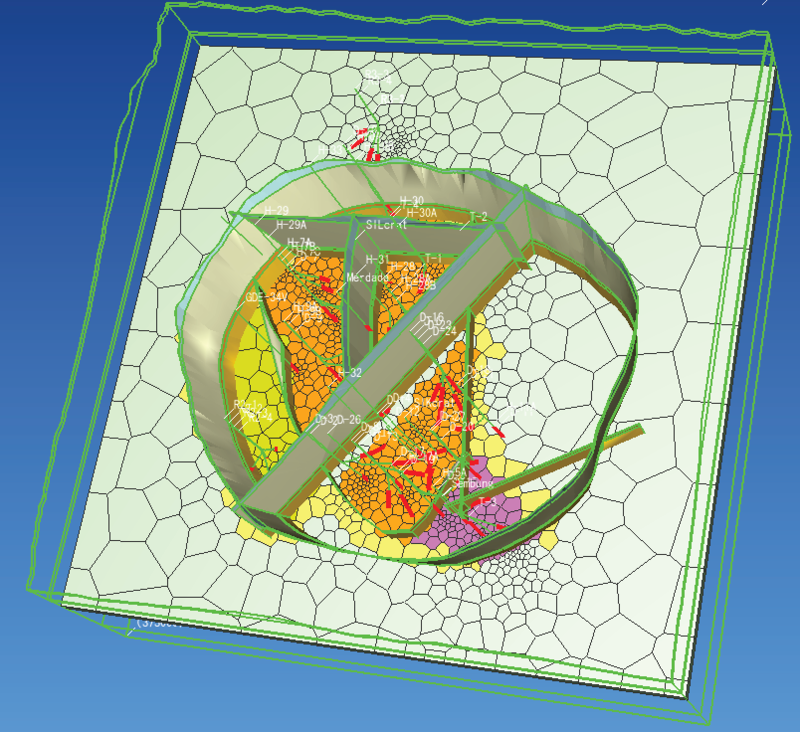 The conceptual model can be created based on xyz surfaces exported from other modeling programs such as RockWorks or Surfer, or based on a GRDECL file exported from Petrel or other modeling packages. Create natural state model using fixed temperature or pressure boundary conditions, flow rate or flux-based sinks and sources and a variety of initial condition options. Once a natural state model is produced, create historical and predictive models by incorporating deviated production and injection wells that can be easily enabled and disabled. Image taken from Sirait, P; Ridwan, R.L. and Battistelli, A. (2015), Reservoir Modeling for Development Capacity of Dieng Geothermal Field, Indonesia, PROCEEDINGS, Fourtieth Workshop on Geothermal Reservoir Engineering Stanford University, Stanford, California. PetraSim 2017 has added several new features that give improved support for geothermal simulations. These include updates to the TOUGH2 simulator to support updated steam tables, improved well boundary conditions, and more. Specify the start-up time for a well on deliverability. This avoids the need for multiple restarts when modeling a number of make-up wells in field-scale geothermal production forecast. Specify the productivity index (PI) and flowing pressures for each layer of a well on deliverability. IAPWS-IF97 correlations for pure water added to the standard TOUGH2 EOSs. These extend the use of TOUGH2 to near-critical conditions (T>350°C) and to geothermal geopressured conditions (P>1000 bara). IAPWS 2008 viscosity formulation for pure water and steam added to the standard TOUGH2 EOSs. For a detailed list of changes, please see the PetraSim Release Notes. Bedre, Madhur and Anderson, Brian J. (2012). Sensitivity Analysis of Low-Temperature Geothermal Reservoirs: Effect of Reservoir Parameters on the Direct Use of Geothermal Energy, GRC Transactions, Vol. 36. Ciriaco, Anthony E. and O’Sullivan , Michael (2015). 3D Dual Porosity Modeling of Tracer Transport in Palinpinon 1 Geothermal Field, Philippines, Proceedings World Geothermal Congress 2015, Melbourne, Australia. Daniilidis, Alexandros; Doddema, Leon; Herber, Rien (2016). Risk assessment of the Groningen geothermal potential: From seismic to reservoir uncertainty using a discrete parameter analysis, Geothermics 64:271-288. Doddema, L. (2012). The influence of reservoir heterogeneities on geothermal doublet performance, University of Groningen. Kiryukhin, A and Miroshnik, O (2012). Inverse Modeling of the Exploitation of the Mutnovsky Geothermal Field 1984 – 2006, PROCEEDINGS, Thirty-Seventh Workshop on Geothermal Reservoir Engineering, Stanford University, Stanford, California, SGP-TR-194. Maguruza, Ximena (2015). 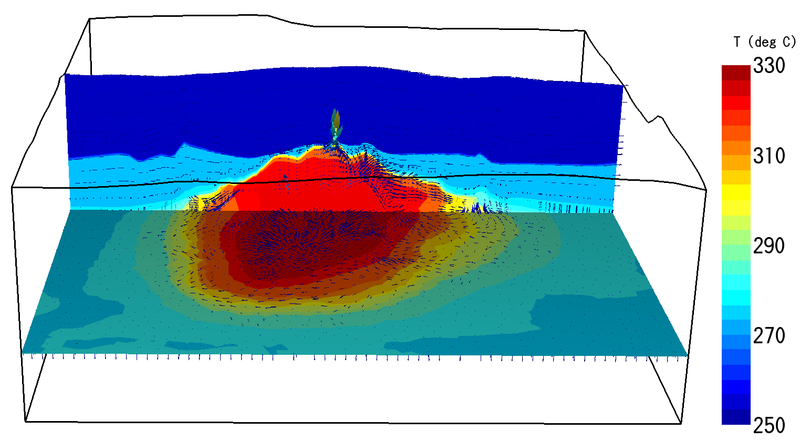 Numerical Modeling of the Hágöngur Geothermal Reservoir in Central Iceland, Reykjavik University. Montegrossi, G.; Pasqua, C.; Battistelli A.; Mwawongo, G; Ofwona, C (2015). 3D Natural State Model of the Menengai Geothermal System, Kenya, Proceedings World Geothermal Congress 2015, Melbourne, Australia. Palabiyik, Yildiray; Tureyen, O. Inanc ; Onur, Mustafa; Deniz, Melek (2013). A Study on Pressure and Temperature Behavoirs of Goethermal Wells in Single-Phase Liquid Reservoirs, PROCEEDINGS, Thirty-Eighth Workshop on Geothermal Reservoir Engineering, Stanford University, Stanford, California, SGP-TR-198. Peluchette, Jason and Anderson, Brian J. (2013). Optimization of Integrated Reservoir, Wellbore, and Power Plant Models for Enhanced Geothermal Systems,PROCEEDINGS, Thirty-Eighth Workshop on Geothermal Reservoir Engineering Stanford University, Stanford, California, SGP-TR-198. Pearson, Sophie C.P. (2012). Modeling the Effects of Direct use on the Tauranga Low-Temperature Geothermal System, New Zealand, PROCEEDINGS, Thirty-Seventh Workshop on Geothermal Reservoir Engineering, Stanford University, Stanford, California, SGP-TR-194. Sirait, Puji; . Ridwan, Ruly H,; Battistelli, Alfredo (2015). Reservoir Modeling for Development Capacity of Dieng Geothermal Field, Indonesia, PROCEEDINGS, Fourtieth Workshop on Geothermal Reservoir Engineering, Stanford University, Stanford, California, SGP-TR-204. Sutter, Daniel; Fox, Don; Anderson, Brian J.; Koch, Donald; Rudolf von Rohr, Philipp; Tester, Jefferson W (2011), Sustainable Heat Farming of Geothermal Systems: A Case Study of Heat Extraction and Thermal Recover in a Model EGS Fractured Reservoir, PROCEEDINGS, Thirty-Sixth Workshop on Geothermal Reservoir Engineering, Stanford University, Stanford, California, SGP-TR-191. Quinao, Jaime J. and Zarrouk, Sadiq J. (2014). Applications of Experimental Design and Response Surface Method in Probabilistic Geothermal Resource Assessment – Preliminary Results, PROCEEDINGS, Thirty-Ninth Workshop on Geothermal Reservoir Engineering Stanford University, Stanford, California, SGP-TR-202. Vaccaro, Maurizio and Conti, Paolo (2013). Numerical simulation of geothermal resources: a critical overlook, European Geothermal Congress 2013.